View More In Belts, Hoses & Pulleys. 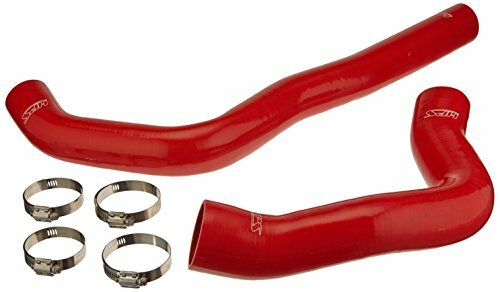 Dodge 99-02 Ram Pickup 5.9L Diesel HPS High Temperature 3-ply Reinforced Silicone Radiator Hose Kit Red is designed to replace stock OEM rubber hoses which can eventually weaken over time, leading to premature failure. With premium quality silicone and race inspired design, this HPS silicone radiator hose kit can withstand the harsh high temperature and high pressure operating conditions of the engine yet still maintaining peak efficiency during competition or daily driving. HPS silicone radiator hose kit has all the correct bends and curves for a perfect fit replacement for your OEM rubber coolant hoses, it is not a cheap one size fits all universal hose you get at the local parts store that you have to fight with to install. Temperature range: -65 degree Fahrenheit to +350 degree Fahrenheit (177 degree Celsius). 100 percent stainless steel clamps are included for easy installation. Silicone hose is not compatible with fuel or oil. If you have any questions about this product by HPS, contact us by completing and submitting the form below. If you are looking for a specif part number, please include it with your message.